An extreme case of “stellar collision” is the tidal disruption (or, more generally, interaction) of a star with a massive black hole (MBH) , i.e. a black with a mass in excess of 1e5 M_sun (Hills 1975, Lidskii & Ozernoi 1979, Rees 1988). If the MBH is more massive than a few , a MS star can cross the horizon without disruption. Such tidal disruptions are of great interest in the dynamics of galactic nuclei. Tidal disruptions at a rate of order 1e-4 per year and per galactic nucleus seem unavoidable, with the likely consequence of bringing back to active life an otherwise quiescent galactic nucleus (Phinney 1989, Sembay & West 1993, Magorrian & Tremaine 1999, Syer & Ulmer 1999). Some flaring events in the UV or X-ray band from the center of active and non-active galaxies have been tentatively interpreted as the accretional aftermath of tidal disruptions (Li, Narayan & Menou 2002, Komossa 2002). Tidal disruptions may also contribute to the feeding of the central BH in active galactic nuclei (Young, Shields & Wheeler 1977, McMillan, Lightman & Cohn 1981, Duncan & Shapiro 1983, Durisen & Cohn 1987a,1987b,Murphy, Cohn & Durisen 1991, Freitag & Benz 2002). The following figure is from Fulbright’s thesis. Young, Shields & Wheeler 1977: Semi-analytical estimate of fraction of mass riped off the star using impulsive approximation. Carter & Luminet 1982, 1983: Semi-analytical model. Propose that high tidal compression may lead to thermonuclear detonation of the star in deep encounters. Nolthenius & Katz 1982: First SPH simulations of the tidal encounter between a star and a massive BH; very low resolution. Bicknell & Gingold 1983: SPH simulation of the tidal disruption => no thermonuclear detonation. Evans & Kochanek 1986: SPH simulation of the disruption and discussion of the fate of the debris. Khokhlov, Novikov & Pethick 1993a, Khokhlov, Novikov & Pethick 1993b: Eulerian grid simulations of weak and strong tidal interactions. Strong squeezing (à la Carter & Luminet) found. Laguna et al. 1993: SPH disruption simulation with GR effects. Central temperature rise not sufficient for detonation. Frolov et al. 1994: Grid simulations of the interaction between a 1e4-1e5 M_sun BH and a white dwarf. Fulbright 1996: SPH simulation of the disruption with spheroidal kernels. Central temperature increase closer to Carter & Luminet’s prediction (so, what about detonation?). Marck, Lioure & Bonazzola 1996: Pseudo-spectral method with adaptative mesh allowing for (relatively) fast 3-D hydro computations. Diener at al. 1997: Eulerian grid simulations of tidal stripping of a n=1.5 polytrope by a Kerr BH. Comprehensive coverage of orbital parameters. Ayal, Livio & Piran 2000: Tidal disruption and first pericenter return of gas stream (SPH with GR effects). Ivanov & Nikonov 2001, Ivanov, Chernyakova & Novikov 2003: Development of a fast 1-D hydro model (could be used for ‘live’ tidal disruption in stellar dynamics code), Kerr BH considered. A coherent picture of the tidal disruption itself (at first pericentre passage) emerges from these works. However, a comprehensive set of simulations, using realistic models (instead of polytropes) for MS and Giant stars, and considering various rotation parameters for the BH and various orbits in a Kerr potential, is still lacking. Also the question of the possibility of thermonuclear detonation of the star remains to be elucidated. Furthermore, the evolution of the liberated gas is a very intricate problem, still poorly understood. About one half of the stellar gas is left bound to the BH. After one orbit, the leading tip of the bound gas stream will collide with the trailing part (Kochanek 1994, Lee, Kang & Ryu 1996, Lee & Kim 1996, Kim, Park & Lee 1999, Ayal, Livio & Piran 2000). An accretion disk or a spherical gaseous envelope will forme around the BH (Cannizzo, Lee & Goodman 1990, Loeb & Ulmer 1997, Ulmer, Paczynski & Goodman 1998, Ulmer 1999, Menou & Quataert 2001). Obviously, a better understanding of the post-disruption accretion process in order to predict its observational signature (wavelength, intensity, duration, etc.). Watch for the work of Tamara Bogdanovic in this field (Bogdanovic et al. 2004). The prompt X-ray and gravitational wave emission at the moment of tidal disruption (firt pericenter pasage) have been considered by Kobayashi et al. (2004). Also some more comprehensive set of simulations, using realistic models (instead of polytropes) for MS and Giant stars would be very welcome. 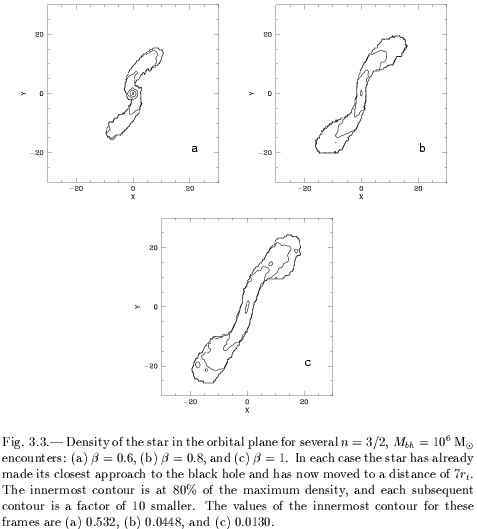 Alexander & Kumar 2000: Tidal spin-up of stars during encounters with the MBH at the center of the Milky Way. Alexander & Livio 2001, Alexander 2003: Survival and appearance of tidally perturbed stars. Di Stefano et al. 2001: Detection of tidally stripped giants. Here, computations of the stellar evolution of tidally perturbed stars are clearly called for. Unfortunately, the problem is compounded with the further orbital evolution of the star and its subsequent tidal interactions with the BH. It can thus be considered as an extreme case of binary evolution problem (See Modest working group 2).